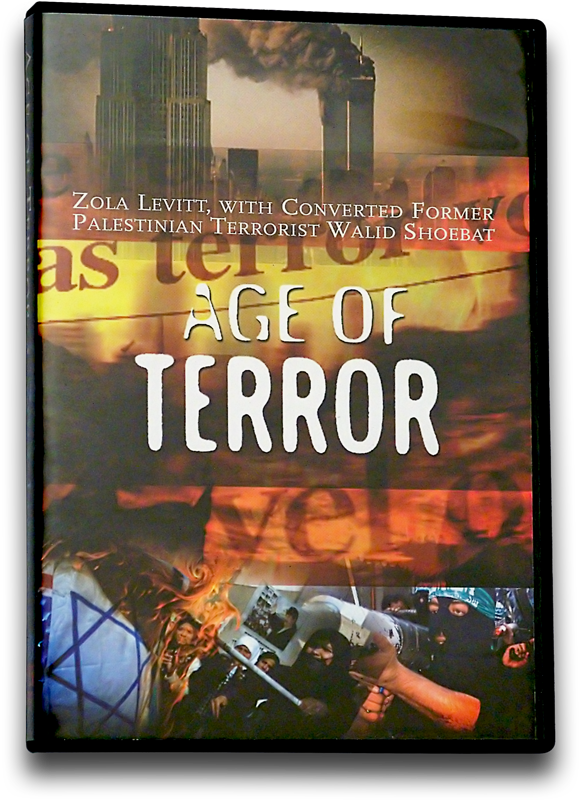 00:28 SHALOM, HELLO AGAIN, WELCOME TO OUR NEW SERIES, "AGE OF TERROR". 00:33 I'M SORRY WE HAVE TO MAKE A SERIES CALLED THAT, BUT WE REALLY DO. 00:37 AND OUR EXPERT, OUR GUEST IS >>WALID SHOEBAT, WHO YOU'VE HEARD >>ON THIS PROGRAM BEFORE. 00:54 AND WE ASKED HIM BACK TO TALK >>ABOUT THIS FASCINATING SUBJECT. 01:06 AND WE'LL TELL YOU ABOUT IT ON LOCATION. 01:08 LET'S GO THERE NOW. 01:15 AND THEY'VE GONE ON FOR ALL TIMES. 01:28 BUT IN BETWEEN, NO FOREIGN PEOPLES, FORTUNATELY HAVE ATTACKED US. 01:32 WE ARE PROTECTED BY OCEANS AND RELATIVELY FRIENDLY NEIGHBORS. 01:36 BUT, THERE WAS NEVER 2 CENTURIES >>OR ANYTHING LIKE PEACE IN ISRAEL. 01:46 ISRAEL WILL CONSTANTLY BE ASSAULTED. 01:48 WE ARE AT THE SITE KNOWN AS DOR, >>WHICH IS VERY ANCIENT. 02:08 AND ESTABLISHED THEIR FISHING VENTURES, SEAGOING TRADE ALONG THE COASTLINES. 02:20 WHAT BECAME CARTHAGE FROM WHERE HANNIBAL CAME. 02:33 ABOUT CAESAREA ON THE ISRAELI COAST. 02:41 BUT THIS WAS A GODLY ASSAULT. 02:42 GOD COMMANDED THE HEBREWS TO >>TAKE THIS LAND AND SO THEY DID. 02:57 ESTABLISHED THEMSELVES ALONG THE COASTS. 03:01 HERE WE HAVE THE FORTRESS. 03:08 TO PROTECT THIS AREA AGAINST A SEASIDE ATTACK. 03:20 THE ASSYRIANS CAME AND CARRIED >>AWAY THE 10 NORTHERN TRIBES OF ISRAEL. 03:29 AND TOOK AWAY THE SOUTHERN TRIBES. 03:59 AND IT PUT ALEXANDER IN MIND OF HIS DREAM AND HE DID NOT ASSAULT JERUSALEM, AS A MATTER OF FACT. 04:11 FROM THAT TIME AND THAT IS DANIEL, CHAPTER 8. 04:37 IT TELLS THE STORY OF THE MACEDONIAN CONQUERING OF THIS PART OF THE MIDDLE EAST. 05:04 AND THE SOUTHERN AREA HERE AROUND ISRAEL. 05:16 AND THE PROPHECY GOES ON TO DISCUSS ONE OF THOSE. 05:37 IS A PROPHECY FULFILLED IN ANTIOCHUS EPIPHANES 175 B.C. 05:43 WHO PROFANED THE TEMPLE AND TERRIBLY PERSECUTED THE JEWS. 05:54 AND HE SACRIFICED A PIG ON THE >>ALTAR, WHICH HOPELESSLY DESECRATED THE PLACE. 06:21 BECAUSE HE DID EXACTLY WHAT THE >>ANTICHRIST WILL DO. 06:38 BUT THE JEWS DID A PUN ON IT AND >>IT MEANT "HE IS CRAZY" IN THEIR LANGUAGE. 07:07 WELL, WE'RE REMINDED OF DANIEL >>9:27 ABOUT THE ANTICHRIST. 07:10 IN THE MIDST OF THE WEEK HE'LL >>CAUSE THE SACRIFICE ON THE OBLATION TO CEASE. 07:16 AND HE'S GOING TO DO THE SAME THING. 07:29 TO TALK ABOUT THE ANTICHRIST. 07:45 AS HE SAYS THE LATTER TIME, THIS IS THE ANTICHRIST. 07:53 THE ANTICHRIST, OF COURSE, MOTIVATED BY SATAN HIMSELF. 08:04 THESE THINGS THE ANTICHRIST WILL DO. 08:13 AND HERE'S THE PHRASE THAT'S TOTALLY CONVINCING OF THE ANTICHRIST. 08:34 AS AT THE END OF THE UPCOMING TRIBULATION PERIOD. 08:45 THE MIGHTY ROME TOOK OVER THIS >>PLACE IN THE 2ND AND 1ST CENTURIES B.C. 08:51 AND THEN ASSAULTED IT AND DESTROYED THE TEMPLE IN THE 1ST CENTURY A.D.
08:55 AND WILL COME AGAIN, I SUPPOSE, >>IN THE 21ST CENTURY, A.D., THE TIME WE LIVE NOW. 09:11 BUT, BECAUSE OF ANTIOCHUS, IT APPEARS HE IS OF A GRECO-SYRIAN HERITAGE. 09:23 IN ROME OR HE COULD JUST BE A GRECO-SYRIAN. 09:45 AND I COME FROM LEBANON, BUT I COME FROM THE PHOENICIAN STOCK." 09:48 AS A MATTER OF FACT HE SORT OF >>HAD AN APPEARANCE LIKE THAT. 09:55 WITH SOME MIDDLE EASTERN BLOOD AND THAT IS HOW THE ANTICHRIST >>IS CHARACTERIZED. 10:03 AND DR. MCCALL AND I HAVE WRITTEN THAT IN OUR BOOK "SATAN IN THE SANCTUARY"
10:08 AND THAT'S BEEN UNCHALLENGED FOR 30 YEARS. 10:11 OF COURSE, PEOPLE GUESS AT THE >>IDENTITY OF THE ANTICHRIST, >>THAT'S A PRETTY HOPELESS GAME. 10:15 BUT, THESE HERITAGES THAT YOU CAN GATHER FROM PROPHECY ARE VERY CONVINCING. 10:32 BUT, THE WHOLE WORLD, EVEN AMERICA. 10:47 THEN THE MUSLIMS CAME IN AND THEY ARE STILL IN THE LAND. 10:50 BUT, THE PALESTINIANS ARE NOT THE ANCIENT PHILISTINES. 10:59 THAT THEY DESCEND FROM THE PHILISTINE. 11:11 AND THEY BUILT THE SIMILAR ONES >>IN GAZA. 11:13 THEY INTERMARRIED OR TRIED TO INTERMARRY WITH THE HEBREWS. 11:16 THAT PROBABLY WASN'T AS >>SUCCESSFUL BECAUSE THE HEBREWS HAD A LAW AGAINST INTERMARRIAGE. 11:24 THEY DID NOT MARRY. 11:25 DELILAH WAS A PHILISTINE. 11:27 SAMSON, OF COURSE, A JUDGE OF ISRAEL. 11:38 THE PHOENICIANS, THE PHILISTINES, ETC. 11:40 IT'S ONLY A RE-USE OF THE NAME >>BY THE ROMAN EMPEROR HADRIAN IN 135 A.D.
11:52 AND USED THEIR NAME TO CALL ISRAEL, PALESTINE FOR AWHILE. 11:56 IT WAS CHANGED BACK IN 1948. 12:09 THE 1000 YEAR KINGDOM ON EARTH. 12:22 AND ESTABLISHING A 1000 YEAR KINGDOM. 12:25 AT LAST, 1000 YEARS OF PERFECT >>PEACE IN ISRAEL. 12:46 AND CATALOG WITH VIDEOS, BOOKS AND MUSIC. 12:54 READING PACKETS, TEACHING CASSETTES AND MAIL IN TESTS. 13:01 GREECE AND THE HOLY LAND EXPERIENCE THEME PARK IN ORLANDO FL.? 13:06 PLEASE CONTACT US FOR MORE INFORMATION. 13:18 GO TELL MY BRETHREN TO GO INTO >>GALILEE, THERE THEY WILL SEE. 13:23 IT STRENGTHENS OUR FAITH TO KNOW THAT JESUS WALKED ON THE WATER AND THAT WE CAN CALL OUT TO HIM. 13:30 IT MAKES THE WHOLE SCRIPTURES COME TO LIFE. 13:43 WELL, THAT'S ISRAEL AS WE SEE IT >>WHEN WE TOUR. 13:46 COME ON ALONG, TAKE A LOOK AT IT >>FOR YOURSELF, AN AMAZING, SIMPLY AMAZING PLACE. 13:51 YOU GREW UP THERE WALID. 13:55 YOU FASCINATED ME RIGHT BEFORE >>THE PROGRAM. 14:00 IT MEANS OF THE BRANCHES, OF THE TRIBES. 14:08 WE COULD BE RELATED TO THE TRIBES OF ISRAEL. 14:13 EATING THE LAMB STANDING UP WITH THE MEN'S CANES IN THEIR HAND. 14:18 LIKE IN THE EXODUS. >>EXACTLY. 14:20 I DIDN'T KNOW THAT. 14:21 NONE OF MY FAMILY KNEW THESE THINGS. 14:22 THEY GO AND CROSS THE JORDAN RIVER TO COMMEMORATE MOSES, BUS LOAD AND THEY DANCED. 14:28 DANCING IS NOT PART OF ISLAM. 14:34 TAKING THE BRIDE OVER TO DAVID, >>TAKING THE BRIDE OVER TO SOLOMON. 14:44 THAT HAVE THE PROPHET MOHAMMED, >>THE PROPHET OF ISLAM IN THEM. 14:53 AND YOU SACRIFICE THE WHEAT, SO IT'S A LIKE A MINHAU. 14:57 THIS IS VERY JEWISH. >>VERY JEWISH. 15:12 YOU TAKE THE BLOOD OF A LAMB AND YOU POUR IT ON THE FOUNDATION STONE. 15:21 THEN YOU PUT BLOOD OF THE LAMB >>ON THE DOORPOSTS, THE BLOOD OF THE LAMB. 15:25 ON THE DOORPOST. >>ON THE DOORPOST. 15:26 (SPEAKING HEBREW) THAT IS VERY ISRAELI. 15:33 AND A LOT OF THESE CUSTOMS, WE CARRIED THEM ON. 15:47 WHICH IS A DEFICIENCY OF CHROMOSOME 16. 15:49 THEY FOUND OUT THIS IS SOMETHING THAT CAME OUT OF SEPHARDIC JEWS, >>3000 YEARS AGO. 15:58 TURKS WHO HAVE IT AND DRUZE WHO HAVE IT. 16:01 THE DRUZE PEOPLE IN ISRAEL. 16:06 BUT THE HEAVIEST IS AMONG THE SEPHARDIC JEWS. 16:09 SO, THERE'S A LINK SOMEWHERE. >>GENETICS DON'T LIE. 16:13 SO, THERE'S A RELATION THERE. 16:16 IT'S SORT OF OUR SUBJECT HERE. 16:26 THAT THESE PHOENICIAN SAILORS >>BROUGHT BACK BUDDHAS AND SO ON >>FROM THE FAR EAST. 16:32 THE WORLD IS REALLY KIND OF A SMALLER PLACE THAN IT WAS IN ANCIENT DAYS, THAN WE THINK. 16:40 YOU HAVE HAMIDIC PEOPLE >>WHO WENT OVER TO THE AMERICAS, >>THE INCAS, ALL OVER. 16:45 THE DESCENDENTS OF HAM, SO YOU HAVE BIG TRAVEL. 16:54 THAT FASCINATES ME, >>FOR REASONS OF THE ANTICHRIST. 16:58 DEVELOP THAT A LITTLE BIT FOR ME. 17:08 OVER THE ANTICHRIST WHO'S CALLED >>AS WELL, THE LITTLE HORN. 17:24 ALEXANDER THE GREAT IS NOT FROM CYPRESS. 17:27 HE'S THE MACEDONIAN. HE'S FROM MACEDONIA. 17:39 YOU WILL GET EXACTLY THE BORDERS OF THE GRECIAN EMPIRE AS WELL. 17:43 CAN YOU SHOW US? 17:48 AND IT GOES DOWN ALL THE WAY PAST TO NORTH AFRICA AS WELL, THE MIDDLE EAST. 17:54 BUT, HOWEVER, IT DOESN'T INCLUDE EUROPE. 18:08 WHICH MOST PEOPLE WHEN THEY >>THINK ROMAN EMPIRE, THEY THINK >>ITALY OR ROME. 18:14 THE PEOPLE OF THE PRINCE THAT SHALL COME. 18:17 THE PRINCE THAT SHALL COME. 18:29 2000 YEARS LATER OR SO. 18:33 WILL BE THE ONES TO DESTROY THE CITY AND THE SANCTUARY. 18:38 SO THAT WAS IN 70 A.D.
18:40 TITUS WAS NOT THE FULFILLMENT. 18:42 TITUS WAS A TYPE OF FULFILLMENT. 18:44 THE ROMAN EMPEROR. >>THAT'S RIGHT. 18:49 IT SAYS, "AND HE WILL ESTABLISH A PEACE COVENANT FOR 7 YEARS." 18:54 CANNOT PERTAIN TO TITUS >>BECAUSE TITUS NEVER ESTABLISHED >>A 7 YEAR TREATY. 19:08 WHICH WAS THE 10TH ROMAN LEGION. 19:15 WAS HEAD OVER THE EASTERN LEGION >>OF THE ROMAN EMPIRE, NOT THE WESTERN. 19:25 BECAUSE IT'S THE PEOPLE OF THE >>PRINCE WHO IS TO COME. 19:30 THIS IS YOUR MOST FASCINATING THEORY. 19:32 GO AHEAD AND TELL ME. 19:32 THEN YOU LOOK AT LEGION 10, >>IT COMPOSED OF SEVERAL COHORTS. 19:36 COHORT PETRONIUM FROM PETRA. 19:40 LET'S NOT FORGET THAT PETRA, >>DOWN FROM SOUTHERN JORDAN. 19:43 THAT'S RIGHT, THOSE ARE THE ARABS. 19:44 BECAUSE PETRA WAS FOUNDED BY THE NABATEAN ARABS. 19:50 VERY SPELLED OUT IN THE DIVISION OF THE COHORTS IN THAT 10TH LEGION. 20:02 IN THE MANNER THAT WE USE IRAQI SOLDIERS TODAY IN ATTACKING FALLUJAH. 20:10 YOU USE THE LOCALS WHO CAN SPEAK THE LANGUAGE, WHO KNOW THE TERRAIN. 20:12 SO THE BIBLE WANTED TO BE SPECIFIC THAT WE NAIL IT ON THE HEAD. 20:20 THAT'S WHO WE SHOULD BE LOOKING FOR. 20:28 IT'S TRYING TO BE MORE SPECIFIC, >>THERE IS THE GRECO-ROMAN, IF YOU WILL. 20:33 THE GRECO EMPIRE THAT IS PART OF IT. 20:37 IT TALKS ABOUT RAISING THE CHILDREN OF ZION. 20:41 NOW, ZION IS NOT A DESCENDENT, ZION IS A GEOGRAPHICAL LOCATION. 20:44 I WILL RAISE YOUR SONS, OH ZION, >>TO FIGHT AGAINST YOUR SONS, OH YAVON. 20:51 IT'S TRANSLATED IN ENGLISH AS GREEK, GREECE. 21:01 IONIA WILL BE IN THE TURKISH REGIONS OVER HERE, SYRIA AND TURKEY, THAT REGION. 21:17 AND ISRAEL WILL BE VICTORIOUS BECAUSE THE CHILDREN OF ZION WILL BE SET LIKE A BOW. 21:25 AND I WILL HAVE THIS BATTLE >>WHERE ISRAEL WILL BE VICTORIOUS. 21:31 HE WILL COME FLAMING FROM THE SOUTH. 21:34 WHERE'S HE GOING IF HE'S COMING FROM THE SOUTH? 21:39 THAT SAYS THE ANTICHRIST IS COMING FROM THE WEST AT ALL. 21:42 THERE IS NO INVASION FROM THE WEST. 21:44 ALL THE INVASIONS TALK ABOUT AN INVASION COMING FROM THE NORTH. 21:53 AND APPARENTLY WE'RE FOCUSING >>MORE IN THE WEST TOWARDS EUROPE. 21:59 IS REALLY THE FALLING AWAY OF THE CHURCH. 22:02 THERE IS AN INFLUENCE OF ISLAM >>IN EUROPE. 22:05 TURKEY IS TRYING TO JOIN THE EUROPEAN UNION. 22:07 THERE'S A MASS EXODUS OF MUSLIMS >>INTO EUROPE. 22:14 AT HOW MANY MUSLIM FUNDAMENTALIST ARE WALKING DOWN THE STREETS. 22:17 SO, THE CHURCH IN EUROPE HAS BEEN DILUTED TREMENDOUSLY. 22:20 THIS ALSO IS TRYING TO TAKE AFFECT IN THE UNITED STATES, AS WELL. 22:23 SO, THE FALLING AWAY HAS >>HAPPENED AND IT'S IN EUROPE AND >>THE UNITED STATES, AS WELL. 22:34 SO WE NEED TO LOOK, WHERE IS THE >>FALLING AWAY HAPPENING? 22:36 WALID, YOU'RE THEORIES ARE SO FRESH AND INTERESTING. 22:42 THAT THE ANTICHRIST LEGIONS >>THAT WILL ATTACK AND DESTROY THE >>TEMPLE, ETC. 22:46 ARE BASICALLY ARAB TRIBAL OR MUSLIM AREA PEOPLE, NOT REALLY EUROPEAN SOLDIERS. 22:59 STUDENT OF THE BIBLE AND UNTIL THAT DAY I HAVEN'T GOTTEN AN ANSWER. 23:06 I'M WILLING TO ENTERTAIN IT. 23:15 OR HAS A BURDEN AGAINST THE KINGS OF ARABIA, THE BURDEN >>AGAINST THE DESERT OF THE SEA. 23:20 ALL THE BURDENS, ALL THESE NATIONS ARE MUSLIM MENTIONED IN THE BIBLE. 23:34 AND THEY OFFERED FRANKINCENSE, >>INCENSE AND MYRRH. 23:47 THEY'RE PREDOMINANTLY NOW, IF YOU LOOK AT THE MAP, FROM MUSLIM COUNTRIES. 23:50 THEY DIDN'T COME FROM CHINA IN >>FACT; THERE IS A MENTION OF CHINA IN THE BIBLE. 23:54 IT SAYS I WILL BRING MY CHILDREN >>FROM AS FAR AS SINIM, FROM CHINA. 24:00 I ASKED THE QUESTION, WHERE ARE >>THE CURSES AGAINST CHINA? 24:03 WHERE ARE THE CURSES AGAINST ITALY, ROME? 24:06 WHERE ARE THE CURSES AGAINST SPAIN? 24:07 SPAIN IS MENTIONED TWICE, >>ROME IS MENTIONED OVER 15 TIMES, >>NOT A SINGLE CURSE. 24:13 ALRIGHT, HE'S WALID SHOEBAT. 24:15 WE'RE JUST ABOUT RUNNING OUT OF TIME. 24:37 THAT THE PRIMARY ANTAGONISTS OF ISRAEL THEN WOULD BE MUSLIMS FORCES. 24:59 DO YOU THINK THAT WE'RE GOING >>RIGHT FROM WHAT GOING ON TODAY >>TO THE TRIBULATION? 25:06 WELL, WE HAVE TO LOOK AT SOME MARKERS. 25:07 I LOOK TOWARDS TURKEY TO SEE WHEN TURKEY JOINS THE EU, AS WELL. 25:16 HE SAYS "THE MOSQUES WILL BE OUR >>REFUGE, THE DOMES OUR HELMETS >>AND THE MINARETS OUR BAYONETS." 25:27 WHAT HE'S SAYING IS THAT WE'RE >>GOING BACK TO JIHAD. 25:34 YET THE MAN GETS ELECTED IN TURKEY. 25:41 WHY WOULD THEY ELECT A FUNDAMENTALIST INTO POWER? 25:43 YOU HAVE THE REFAH PARTY, THEY'RE INTO POWER. 25:46 AND I SAID THAT IN 1993. 25:47 I WENT AROUND TO CHURCHES SAYING >>TURKEY IS GOING TO ATTACK ISRAEL. 25:52 TURKEY WILL BE AGAINST ISRAEL. 25:54 TURKEY WILL BE ANTI-WESTERN. 25:55 TURKEY WILL NOT HELP THE UNITED STATES. 26:00 AND NOW WE LOOK AT IT, WE HAVE A >>MUSLIM FUNDAMENTALIST. 26:03 IT'S INTERESTING, TURKEY HAS NOT REALLY COOPERATED WITH THE WEST. 26:06 WE WANTED TO PUT SOLDIERS THERE TO ATTACK IRAQ FROM THE NORTH, >>THEY WOULDN'T ALLOW THAT. 26:12 HAVE THEY BEEN FRIENDS TO CHRISTIANS? 26:16 THAT'S WHAT THEY SAY. 26:17 WELL, LET'S NOT FORGET, ZOLA, >>TURKEY WAS RESPONSIBLE FOR THE DEATH OF 2.8 MILLION CHRISTIANS. 26:24 THE ARMENIANS. >>1.5 MILLION MASSACRED. 26:28 IT LITERALLY HAS THE BLOOD OF THE MARTYRS ON ITS HANDS. 26:42 AND HE DEVELOPS THE IDEA THAT >>THE UPCOMING TRIBULATION IS ALL >>ABOUT THAT. 26:48 WE'RE GOING TO HAVE HIM FOR A NUMBER OF PROGRAMS. 26:49 WE'LL BE BACK NEXT WEEK WITH THE HISTORY OF THE WHOLE TEMPLE SITE >>IN JERUSALEM. 26:54 SHA'ALU SHALOM YERUSHALYIM, >>PRAY FOR THE PEACE OF JERUSALEM.